Rebecca Rusch is leading mountain bike rides to raise funds to remove unexplored bombs dropped in Laos during the Vietnam War. It’s a Sunday morning in January and world champion mountain biker Rebecca Rusch is undertaking her toughest challenge yet. She’s leading a group of 11 other riders along the Ho Chi Minh Trail in Laos — a supply route used by North Vietnam during the Vietnam War — from the town of Phonsavan winding up into the mountains through jungle on the way to the country’s historic capital of Luang Prabang. But the goal of the ride isn’t a podium finish. It’s to help clear unexploded bombs from Laos. The vast majority of UXO in Laos is from cluster bombs, which indiscriminately carpets an area, leaving civilians at risk even 50 years after they’re dropped. According to the National Regulatory Authority for unexploded ordnance, a Lao government agency, more than two million tons of bombs were dropped on Laos during the Vietnam War, making the country the most heavily bombed per capita in history. Approximately 270 million cluster bombs were dropped and an estimated 80 million did not detonate according to the agency, instead being buried under farmland and vegetation. 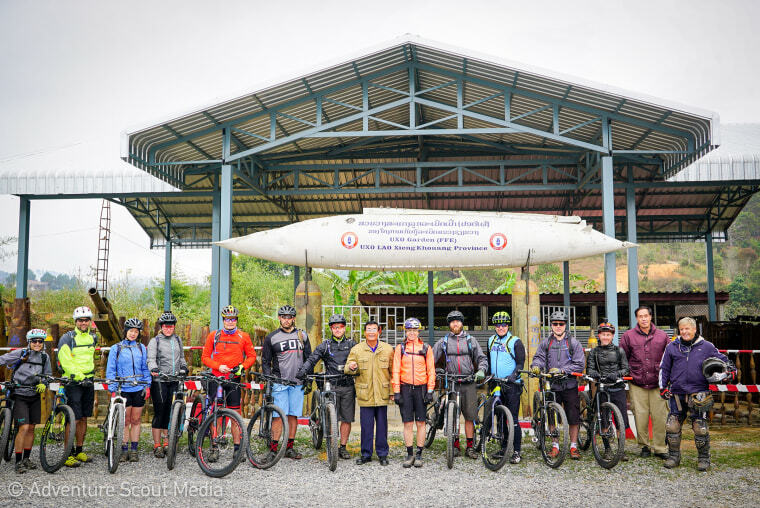 Registration fees from the rides go to support groups such as Article 22 and the Mines Advisory Group, which work toward clearing land of UXO. Rusch’s reasons for ending up in Laos are personal, going back five decades when her father, who was a pilot in the Vietnam War, was shot down in 1972 and disappeared over the trail. Rusch never knew her father: A few years after she was born, he was sent to Da Nang Air Base, where he was stationed and flew bombing missions in Laos, during the U.S. “Secret War” to disrupt traffic and supply lines. “We talked about my dad growing up, but honestly as a kid I didn’t have personal memories of him. As a kid I didn’t know him; it’s hard to miss and love a guy you don’t know,” Rusch said. It wasn’t until 2003, when Rusch was in Vietnam for a multisport race through the jungle that she came face-to-face with the trail and began looking more into her father’s and the region’s past. Rusch’s mother joined her after the race to see various sites from the war and the place where her father disappeared. While standing at the Laos-Vietnam border visiting Khe Sanh, now a coffee plantation but once the site of a brutal battle, their guide pointed at the former trail. “He pointed across and said ’that’s the Ho Chi Minh Trail,‘ and I took a picture … only knowing ‘that’s where your dad died shooting over the Ho Chi Minh Trail, and we weren’t supposed to be there,’” Rusch recalled. “When I rode the Ho Chi Minh Trail, I firmly believe that my career brought me to that tree and to the place, for him to teach me and show me, and give me a job to do. So I’m motivated to clear up UXO in Laos through the mountain bike trips, through the ‘Blood Road’ screenings,” she said. In addition to funds raised from screenings of the film, money from the rides go to help fund more work. During the January trip, the bikers visited the village of Naphia, where residents use scrap metal from bombs to make jewelry as part of Article 22. Each bracelet they sell provides the funds to help clear 12.5 square meters of land of UXO. “I came home a little bit depressed for the first time thinking ‘oh my god, this is going to take 100 years to clear these bombs,‘ but I also came home thinking ’it’s better for me to do something than nothing,’ so I feel like this trip is a ripple effect; all these people are going to go home and talk about this, and suddenly it’s 12 more people, who tell 12 more people,” Rusch said.